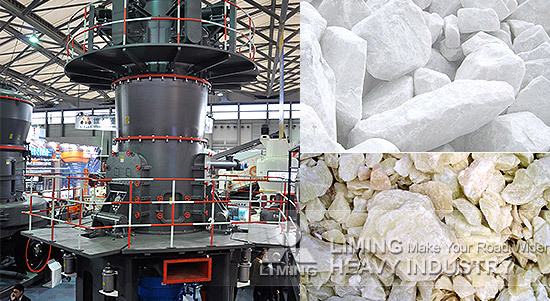 Liming heavy industry with more than 30 years manufacturing experience of four generations of grinding mills, introduced the German advanced technology, designed and developed the new Superfine Grinding Mill-LUM Series Superfine Vertical Roller Grinding Mill. It can be widely used in attapulgite, bentonite, calcite, limestone, GCC, talc, barite, dolomite and other non-metallic mineral ultra-fine powder processing, is the first choice of Large-scale construction of non-metallic mineral grinding. Compared to the traditional grinding mill, LUM Series Superfine Vertical Roller Grinding Mill use grinding material layer principle. The material in the mill residence time is short, less repeat grinding, less iron, the powder whiteness and neatness is high. The special design of roller sleeve and grinding curve liner, can grinding to the desired fineness 0.045-0.02mm (400-1250 mesh). It use the principle of multi-wheel classifier, all wheels can be frequency control, finished powder can control precisely. Currently, LUM Series Superfine Vertical Roller Grinding Mill has been successfully applied to domestic and international ultra-fine powder processing project, the effect is significant, and has got deep favor and high praise from the customers.